First-year Hunter Padgett, a California native and USD swimmer, broke the 400-meter freestyle record on Oct.10 during the Coyotes dual meet against Western Illinois – a record that had been standing since 1996. Jacob Lutz: You’re from Carlsbad, Calif., a beautiful city on the beach, and you’ve come to a small, almost unheard of town in South Dakota. What’s been the biggest adjustment? Hunter Padgett: Definitely the weather. In California I’d wake up and throw on a pair of shorts. Here I have to look at the weather. It varies a lot. California is pretty much a straight path until December. Here it’s colder in October and November. The outfits change everyday, but it’s cool. I like it. J.L. : What made you choose USD? H.P. : Swim. Just swimming in general. J.L. : Were you looking at any other schools besides USD? H.P. : A little bit, but not as much as this one. J.L. : Are there any other sports that you’re really into? H.P. : I like to surf and mountain bike a lot. 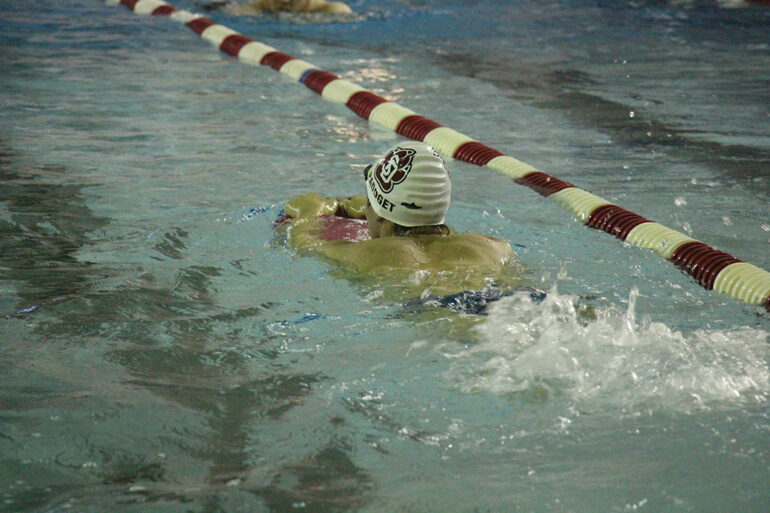 I used to play soccer and baseball through middle school, but in high school swim took over. J.L. : Do you have any other hobbies or skills besides swimming that you do? H.P. : I like hiking a lot. I love to hike and surf. But other than it’s just swim. J.L. : That seems to be a strong commonality from other swimmers I’ve talked to. It sounds like it just takes over your entire life. J.L. : What’re your goals for the season? H.P. : Hopefully do well mid-season, and probably place top eight at conference. J.L. : So you broke a record that had been sitting there for 19 years. Were you aware of that record going into the race? H.P. : I wasn’t. I didn’t even know that record existed. The guy next to me, I knew he was fast, so my coach told me to go for it. And I decided just to go, and touched the wall and got out, and then the announcer said, “There was a record broken.” I looked over at the record board, and it wasn’t even up there. I was just like OK, cool. J.L. : What’s your favorite thing about swimming? H.P. : The team aspect of it, especially here. Everyone’s so close. It’s really a team sport when you think about it, but it’s also an individual sport. Because you want to do better, but you also want your team to do better. So, it’s really in between, but it’s more of a team sport in my opinion. J.L. : How difficult is it balancing swimming and school at the same time? H.P. : Pretty difficult, because you’re tired from swim, but then you also want to do well in school so that you can continue to swim. So it’s kind of a balance. They counter each other. So, if you’re tired in swim, you don’t do well in school, but if you don’t do well in school, you can’t swim. J.L. : How often do you guys practice? H.P. : Everyday. Monday, Wednesday, Friday four hours a day. Two hours in the water and two hours out of the water, and then Tuesday and Thursday about two and a half hours. An hour and 40 minutes in the water and then about an hour of dry land. J.L. : Do you guys ever do two-a-days, where you practice in the morning, and then later in the day practice again? H.P. : Yeah, we switch off with girls for the mornings. So Monday, Wednesday, Friday, girls will swim and guys will do dry land, and then at night guys will swim and girls will do dry land. J.L. : What’s your intended major? J.L. : What do you want to do with that? H.P. : Hopefully go back to California, and either work for one of my friend’s families that has a business or start my own. J.L. : Is there any athlete, or public figure, or maybe not even a public figure, but somebody that you would consider the most influential person in your life? H.P. : Probably my dad. He swam in college as a walk-on, didn’t even get recruited. Then ended up going to the NCAA Championships as a junior and he’s helped me a lot through swim, too. He coached me for my state meet my senior year in high school, and he knows stroke technique. He knows everything. He knows a lot about swim.